Enter the FTP details from your WebMate welcome email in to the Transmit setup page, you can use FTP or WebDav, details for the WebDav method are below. 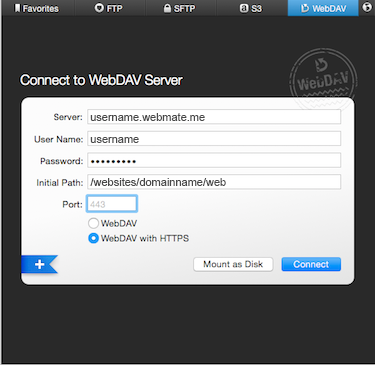 Step: #1: Setting up Transmit & WebDav to WebMate. (username replaced with your WebMate username). User Name: Your WebMate username. Ensure WebDav with HTTPS is selected when connecting to your WebMate. Please note: When you have connected to WebMate, the default folder you connect to will be the /websites/domainname/web/ folder - this is your primary website folder, you may need to navigate to a different folder before you upload or download your files.